There has been a lot of information floating around about converged fabric with Hyper-V in Widnows Server 2012 and a lot of information about how to configure a Converged Fabric using PowerShell. The purpose of this blogpost is to explain in detail how to deploy Converged Fabric using System Center 2012 – Virtual Machine Manager 2012 SP1. The reason there are so many examples explaining how to deploy a Converged Fabric using PowerShell is because a lot of the things you need to configure are not available in Hyper-V Manager, Failover Cluster Manager or any other GUI tool built into Widnows Server 2012. You can however, deploy a converged fabric using SCVMM 2012 SP1 once you have all of your fabric components put into place. So What is Converged Fabric? A typical Hyper-V host network configuration pre Windows Server 2012 often dedicated physical network interfaces per host workload (1 NIC for Management, 1 NIC for Cluster/HB, 1 NIC for Live Migration, 1 NIC for Hyper-V Switch etc.). This required a lot of often underutilized physical NICs and a number of port configurations per Hyper-V host on the physical switch. Apply QoS policies to ensure a minimum bandwidth requirement for specific virtual adapters should network congestion occur on a single physical network link. What is required in VMM? Logical Network’s are a container for Logical Network Definitions which contain the associated VLANs / Subnets for a specific location. – That’s a lot of containing ! Navigate to the “Fabric” pane in VMM > and select “Logical Networks” under “Networking” > click “Create Logical Network” in the action pane. Give your Logical Network a useful name and check the box for “Network sites within this logical network are not connected” – This will enable us to use VLAN isolation. Our next step is to create a “Native Uplink Port Profile”, this is going to define the physical NIC team as well as what Logical Network Definitions (Network Sites) it has available to it. On the next page select your Logical Network Definition (Network site) for this Uplink Port Profile > click next > click finish. 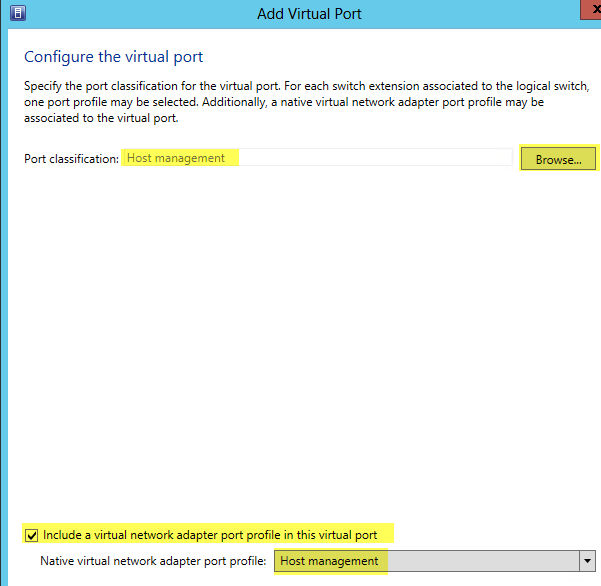 Note: You will notice that on the “Network configuration” page of the “Create Native Port Profile” wizard you see a box you can check for “Enable Windows Network Virtualization”. What this does is enable the “Windows Network Virtualization Filter driver” on the physical links for the purposes of enabling NVGRE. For the purposes of this post we will not be digging into NVGRE but it should be noted that this is where you can globally enable the filter so you can use that feature in Hyper-V. 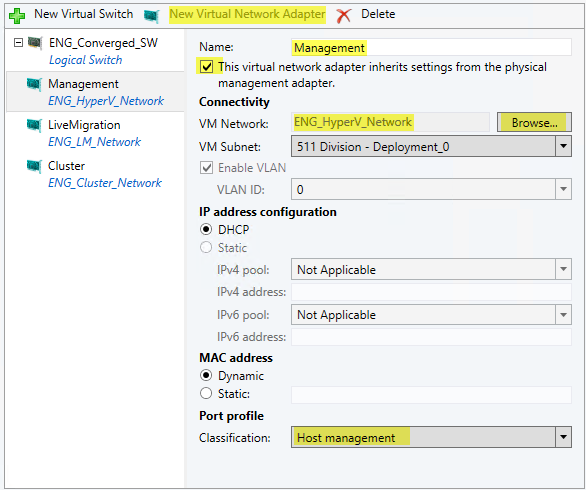 When we go to deploy this configuration to a Hyper-V host we will actually assign Virtual Network Adapters to the host (just like we do with a VM). With the use of Native Virtual Adapter Port Profiles we can actually define the Offload Settings (adapter offloads), Security Settings (things like DHCP guard) and Bandwidth Settings (QoS). Fortunately for the purposes of the Virtual Adapter workloads we plan on deploying (Host Management, Live migration and Cluster), VMM already has some good examples which shipped with VMM. We are going to use these built in ones so go ahead and review them, pay particular attention to the “Bandwidth Settings” tab and more specifically the “Minimum bandwidth weight”. Instead of going Hyper-V host to Hyper-V host and manually creating your virtual switches this is where we can build a single switch which we then deploy to our Hyper-V hosts. This Logical Switch will contain the Uplink Port Profile which will determine the teaming settings for the physical adapters on the Hyper-V host as well as the Virtual Adapter Profiles available on the switch to be used for both ManagementOS workloads (Host Management, Live Migration, Cluster etc.) and Virtual Machine workloads (High bandwidth, medium bandidth etc.). Navigate to the “Fabric” pane in VMM > and select “Logical Switches” under “Networking” > Click “Create Logical Switch” in the action pane. On the “Uplink” tab specify your “Uplink Mode” to be “Team” > Click “Add” under “Uplink port profiles” and select the uplink port profile you created in the previous step. We now need to create the VM networks which basically creates an object we use to plug a virtual network adapter (assigned to the host or a VM) into a specific network, VLANs in our example. Now that we have all of that built in VMM we can finally deploy our converged fabric to our Hyper-V host(s) via the Logical Switch. 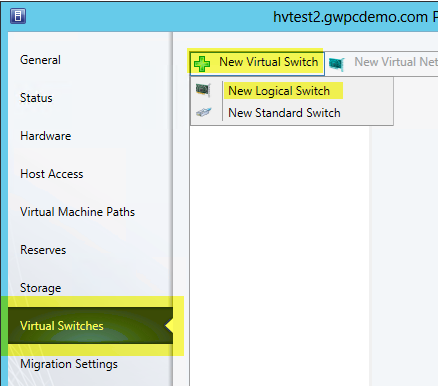 To get ready for this have a Hyper-V host added to VMM which does not yet have a virtual switch. Be sure this Hyper-V host is added to the Host Group which your Logical Network Definition (Site) is assigned to. Note: Only select the box for “This virtual network adapter inherits settings from the physical management adapter” for the “Management” virtual network adapter. 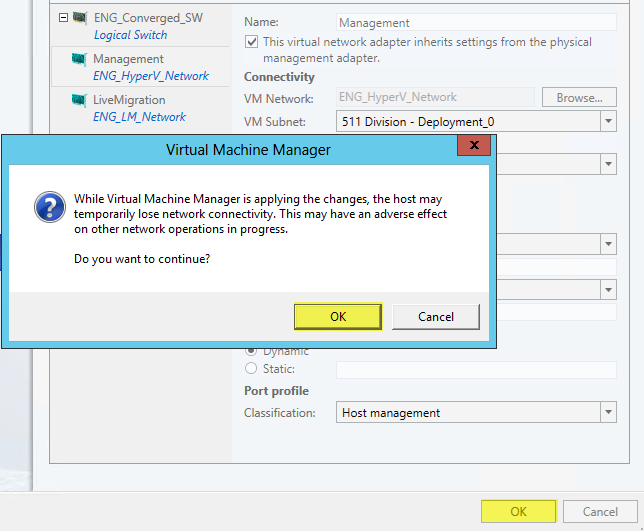 This will move the IP settings from the current management adapter to this virtual adapter insuring VMM can continue to connect to this host during the deployment of the logical switch. I have found that without this it will likely pick up a new IP from DHCP and without an administrator flushing the DNS on the VMM server during the deployment of the Logical Switch your job will not complete and you will have half of your converged fabric deployed. Weighted QoS policies are nice because they will not kick in unless traffic contention actually occurs over one of the physical links. This means Live Migration can consume 100% of a physical link until one of the other adapters is contending for traffic, at which point QoS with throttle the traffic. Currently VMM is not capable of setting Jumbo Frames on either the Physical NICs or specific ManagementOS vNICs. In my case I would want each physical link to have an MTU of 9014 and I would also want Cluster and LiveMigration vNICs to have an MTU of 9014. I currently have a PowerShell script I run post deployment to handle this but I hope future releases of the product will resolve this so you manage your entire fabric from one pane of glass. We have now deployed the example converged fabric we talked about at the beginning of this post. I hope you find this useful!